Up until about a year ago, one of the most frustrating things to me about quilting was that no matter how carefully I would measure and sew, my blocks would always come out too small. This made it pretty much impossible to participate in bees and swaps as I could not manage to fulfill the size requirements. Fed up, I searched, read, and did about a little experimenting, and now I feel like I am finally piecing fairly accurately. I am still not perfect or doing "precision quilting" by any measure, but I don't really have the right temperament for that kind of thing anyway. I just want my blocks to be the right size, fit together, and line up properly without a lot of fudging and swearing under my breath. 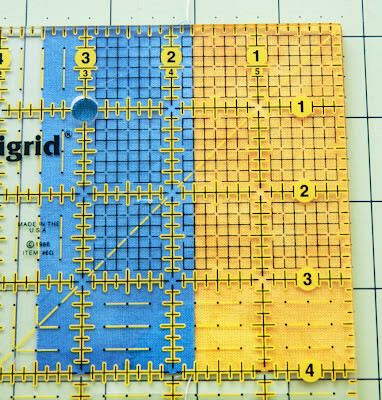 Now, if you are actually interested in super-accurate piecing, you will probably benefit by watching Sally Collins' "Precision Piecing" video on The Quilt Show. I definitely picked up a few new tips that I hope will help me the next time I try to make a really intricate block. She also has a book, "Mastering Precision Piecing" that likely has even more tips than the show. I should also mention that because I am fairly lazy, I am almost never super-precise when the extra care doesn't pay off. For example, in improv piecing I just sew as fast as I can without worrying about the size of the seam, as long as it is more than about 1/8 to 3/16 of an inch so it doesn't come apart. So don't feel like you have to do everything I describe below, exactly as written, every time for every seam. Just be careful when it counts. I tend to think if you can sew a block to measure within ⅛ of an inch of what you wanted, you are doing ok. 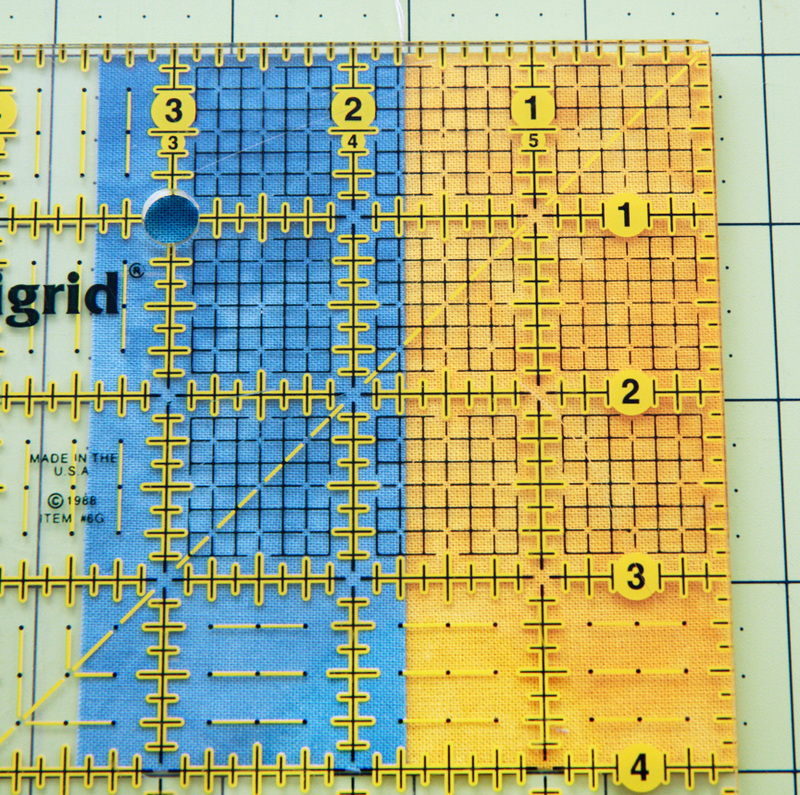 Anyway, in this post I want to focus on the critical components of accurate piecing: cutting, lining up the fabric, stitching, and pressing. Each is important to do properly if you want an accurate block. Below I will talk about each of these things in a little more detail. I will also run you through a little sewing test that should only take about a half an hour and will hopefully greatly increase your accuracy. 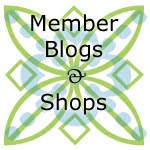 Before I start, though, I want to point out that there are many different ways to do things in the world of quilting, and what I describe below is what has worked for me. I am posting this in the hopes that it might help others that might be frustrated like I was. If you do things a slightly different way and it works for you, then great! If you want to just skip to the test, all the steps are set off like this. I think one of the most important things is cutting accurately. You can sew an extremely accurate seam, but if the pieces weren't the right size to begin with, it won't matter. I used to measure as carefully as I could, but I would center the black line on the edge of the fabric. As it turns out, it works better for some people (including me) to measure with the black line entirely on the edge of the fabric, as in the photo below. 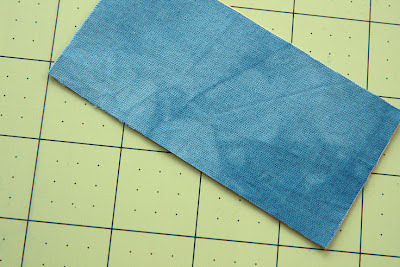 Cut two pieces of fabric exactly 2 inches wide by 4 inches high. Choose two different medium to light colors so you will be able to see your results clearly. Measure your fabric with the black line all the way on the fabric. 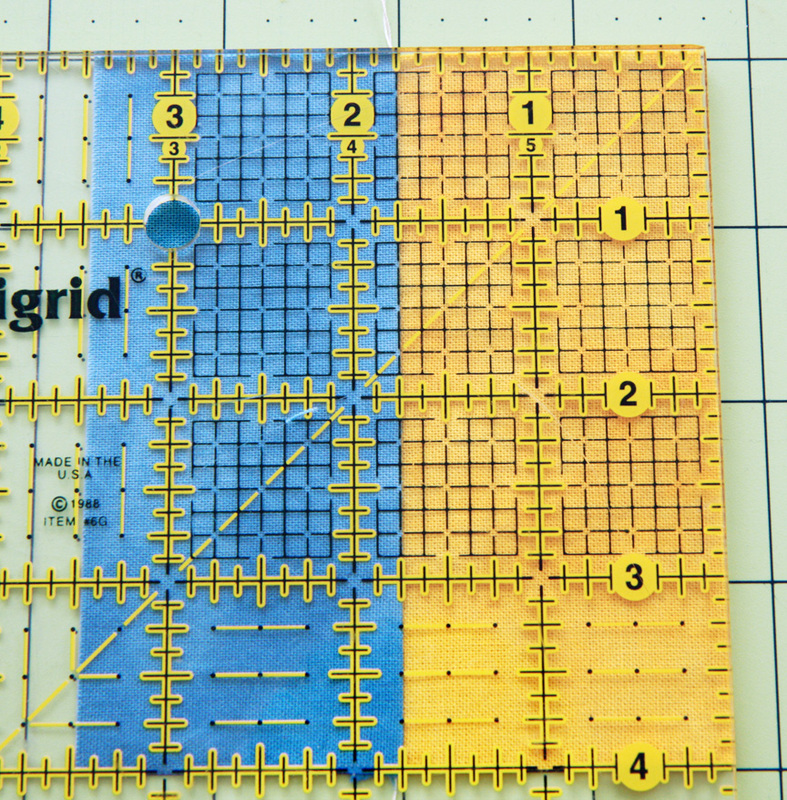 When you are lining up your fabric, be sure that the edges are precisely aligned. When you look at the fabric from above, you should not see the other fabric showing at the edge. You should be able to do this from both sides. Line up your two pieces of fabric along the long edge. Make sure your edges are lined up precisely. 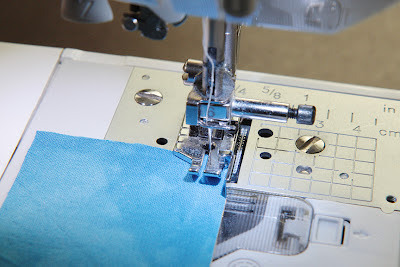 When you feed your fabric into your machine, whether you are chain piecing or not, lift your presser foot and place your fabric right up to the needle instead of letting it be pulled in from the front of the foot. When you just let your fabric be pulled in, the first couple of stitches tend to be crooked. If your machine has a needle up/down setting, have it set to the needle down position. Lift your presser foot and position your fabric right at the needle. Another seam accuracy problem can arise if you let go of your fabric for the last few stitches. 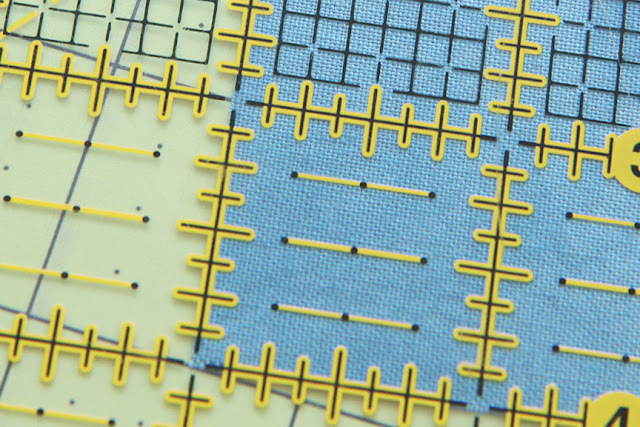 These stitches will then also tend to be crooked, especially on triangular/irregular pieces. To fix this, continue to hold onto your fabric until it is all the way through and past the needle. If you have pieces where there is not much to hold onto (like triangles or curves), use a bamboo skewer, an awl, a stiletto, or a seam ripper to hold the fabric down and guide it through the last few stitches. Attach your piecing foot to your machine (for example, I use a ¼ inch foot that has a metal guide down the side). Leave your needle position in the center and carefully stitch your fabric pair down the long edge. Try to sew as straight as possible. 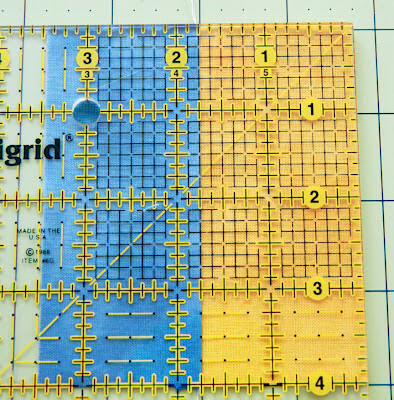 If you do not have a quilting foot with a guide, you can make your own guide out of sticky notes, a few layers of masking tape, or even sticky-backed craft foam and stick it to your sewing machine at the ¼ inch mark. 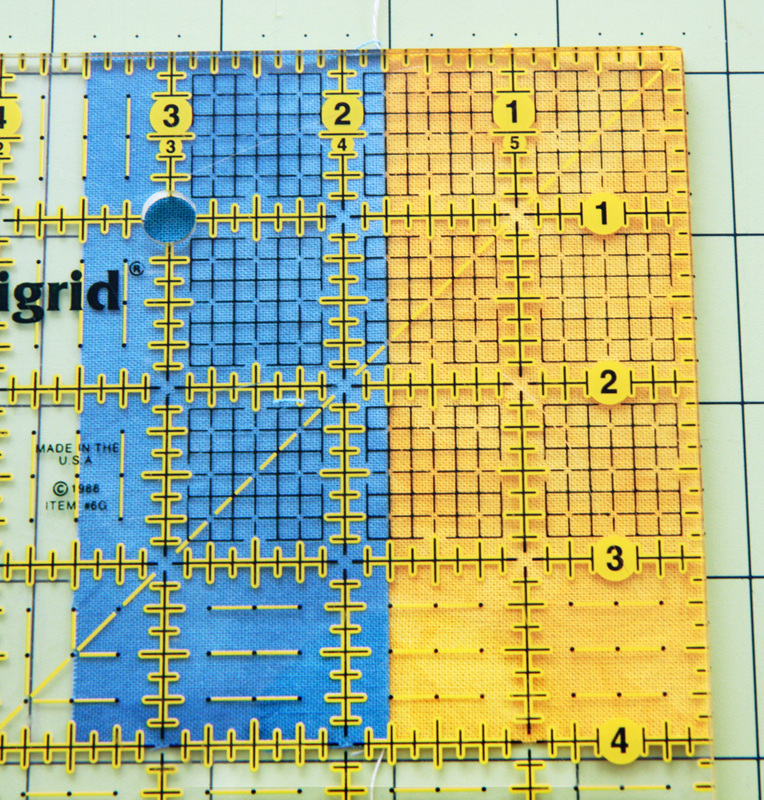 There is also a product called Qtools Sewing Edge that is a reusable vinyl guide that looks pretty handy. I will admit, I am definitely guilty of using lots of ironing and steam to try to tame a seam even though I know you aren't supposed to. However, it really does distort the pieces and will affect your accuracy. 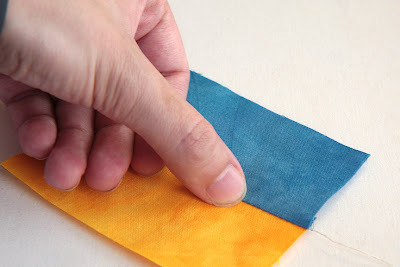 If you press to the side, place your fabric on your ironing board with the fabric you want to press the seam toward on top. If you press open, it doesn't matter which fabric is on top. Press with a dry iron for a few seconds by just lifting up the iron and setting it down, not by moving it back and forth. Pressing while the seam is closed "sets the seam" and gives you a nicer finish. Press your fabric while it is still closed to set the seam. Then, open your fabric up and finger press—run your fingernail or thumbnail down the seam to completely open it up and flatten it. This works best on a harder surface. Angle your nail a bit so the seam gets completely opened; it might take a little practice. If you prefer, you could also buy a wooden or plastic tool, or just use half of a wooden clothespin. If you press your seams open, finger press the seam on the back open as well. Finger press your seam open before pressing with your iron. 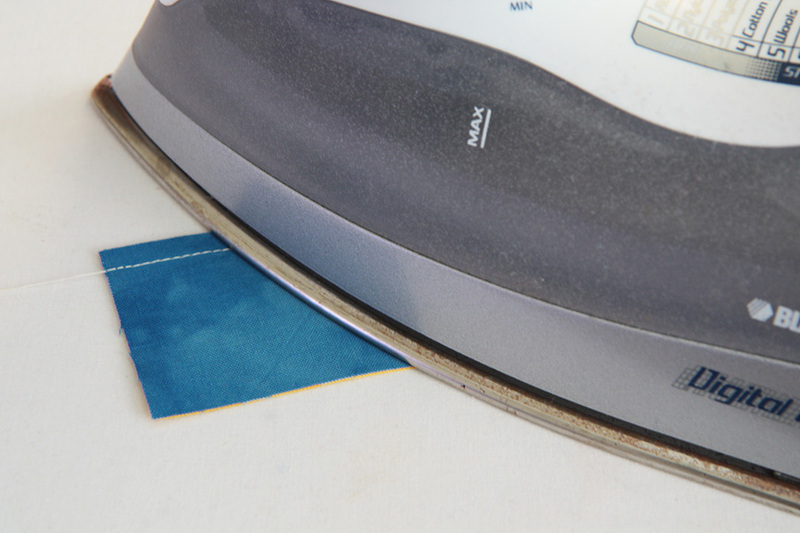 Now press your seam with a dry iron by lifting and repositioning the iron instead of sliding it around. Let your fabric cool without moving it or it will not stay flat. If you are having trouble with it not staying flat, place a ruler or book on top of the still hot seam to weigh it down until it is cool. Press your test fabrics open. Whether you press the seam open or to the side doesn't matter for this test. The last thing to do is to measure your joined fabric to see how accurate your seam guide is. If it is not accurate, you will need to move your guide and/or adjust your needle position to compensate. Your test fabric should now measure exactly 3½ inches wide and 4 inches tall. If it does, you don't need to adjust your needle position and you are done! If it doesn't, go on to the next step. In the photo below, I replicated how I used to cut and sew. I used the center of the black line against the edge of my fabric while cutting, and then just sewed the seam with my ¼ inch foot, with the needle in the center position and the fabric feeding against the guide on this "¼ inch foot". I thought I was doing what I was supposed to do. No wonder I was getting so frustrated! I was off by a little over 1/16 of an inch after just one seam—I had no hope of accurately stitching a block with multiple seams. On a log cabin block with just four rounds, this discrepancy would add up to the block being ½ inch too small! The next photo shows the immediate improvement that is made by cutting with the black line fully on the edge of the fabric. Now it is only off by about 1/32 of an inch. If this was a one or two seam block, that might be good enough. However, on that same four round log cabin block, it would still wind up being about ¼ of an inch too small. The last thing you can do to to get your seams just right is to adjust the needle position on your machine. A quilting foot, with or without a guide, has just a little hole. I thought the needle had to be right in the center, but it doesn't. It turns out that on my machine I can move the needle by a full 1mm in either direction without the needle hitting the foot. When you adjust your needle, do be careful and move the needle down with the flywheel before stitching to check that your needle is clear of the foot. If you think that you cannot move your needle position, try adjusting the "width" of your straight stitch. Sometimes that will do it. If not, then you might need to get by with just attaching a guide to the throat of your machine and moving the guide until you find the right position. 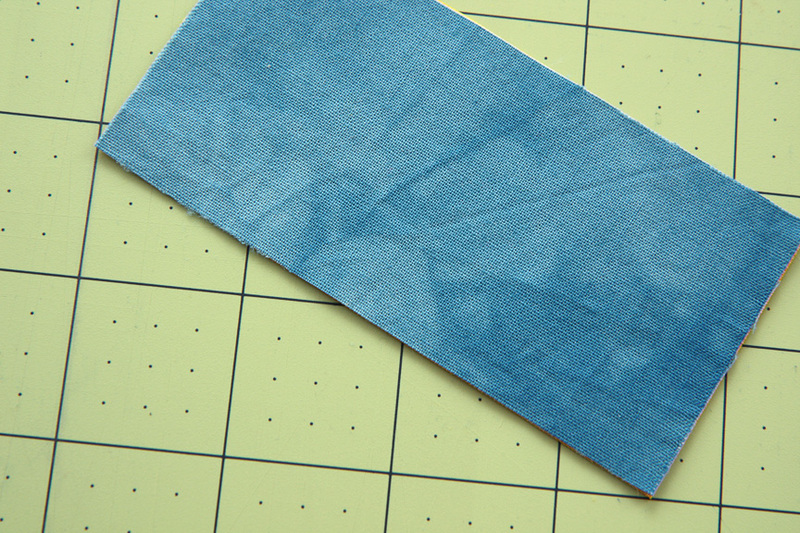 To finish up the test, cut yourself a new set of 2 by 4 inch pieces of fabric. Start by moving your needle position one click to the right if your earlier piece of fabric was too small, and one to the left if it was too big. 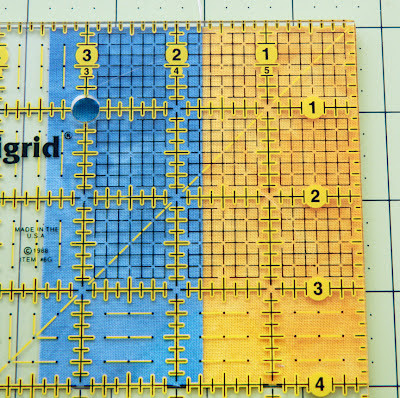 Stitch your seam, press, and measure again. If your block measures exactly 3½ inches, you are done! Write down what needle position was perfect on a piece of masking tape or sticky note and put it on your machine to remind you. If your fabric is still off, cut two more pieces, adjust your needle one more click and try again. Hi Kristin- This is amazing! I especially love the tips about finger pressing, cutting on the black line of the ruler, and being careful when starting and finishing the seam. But, I'm a bit dense so can you please explain a bit more about placing the black line on the fabric when cutting. Are you saying to place the fabric under the center of the black line (not having the black line on the right edge)? Thanks! Hi Ellen, I put the entire black line on top of the fabric. (You can see this in the first photo.) If you find that your new foot now gives you too small of a seam by doing that, you can center the black line on the edge of the fabric. Everyone's machine is different; you need to find the combination of cutting, guides, and needle position that gives you a perfect seam. Excellent - thank you very much for this help!